Michael Warren ‘All on That Day’ (13th July – 14th September) The Dock, Carrick on Shannon, Co. Leitrim. Three monumental beams of wood assemble solidly at the foot of the staircase towards The Dock. This minimalist, sculptural gesture typifies artist Michael Warren’s ongoing pre-occupation with materiality and scale in relation to site. 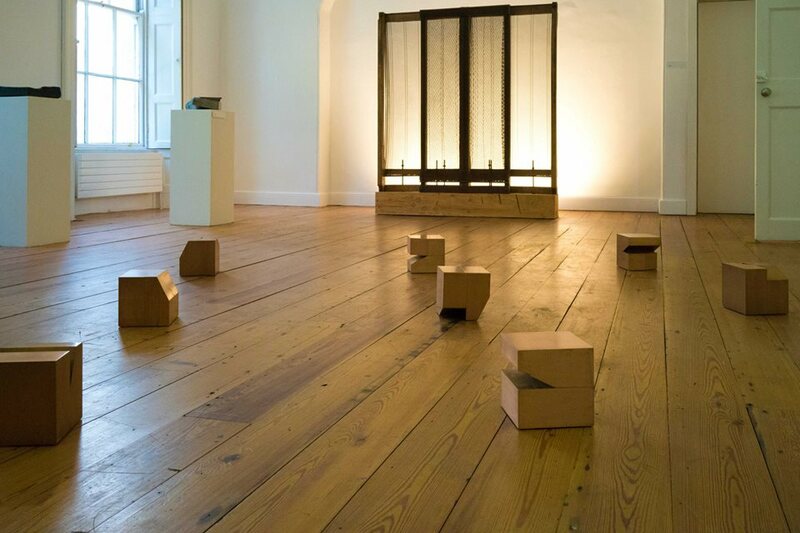 On entering the gallery, the viewer confronts a more complex configuration of materials – Eucalyptus, Yew, Oak and Bog Oak – in ‘Pica Pica’ or ‘Magpie’ (2011). Geometric abstraction gives way to organic, seemingly figurative forms, leaving the viewer to garner some narrative content or meaning from the piece. On reflection, art historical, literary and spiritual references pervade every artwork within this important and well considered exhibition:- Eastern philosophy permeates vertical wooden planks, hung in triptych formations, conjuring a lightness of Chinese paper scrolls flapping in the breeze; Solid slabs of timber, warped into shape, allude to fragility and impermanence, curling at the edges with the ease of a well-thumbed page; Small geometric bronze casts contrast with ashen wooden surfaces, their sharp lines shimmering in metallic repetition. And finally, ‘Sinnerman’ (2013) – an unyielding confessional structure, with steel mesh screen and low rear lighting – appears as a monument to ‘last utterances’, which neither threatens nor soothes, but bears witness (as a magpie might do) to some ominous or unmentionable act.